The village hosted an egg hunt on Easter Sunday morning. Our kids had been to egg hunts in California too (shout-out to our fabulous neighbors! ), so we weren’t expecting this to be any kind of new experience. We were wrong. There were a couple of things that were very different. The eggs are chocolate. These French mamas are not at all shy about sugaring up their children for birthday parties, school events, or the after school goutez (snack). At Easter the eggs are chocolate and they are LARGE. Among our friends in California it would be quite a faux pas to give kids large amounts of candy, so it’s typical to hunt for plastic eggs filled with stickers or small toys. I mentioned this to one of the parents from the village, and she were concerned about the environmental impact of all the plastic eggs. 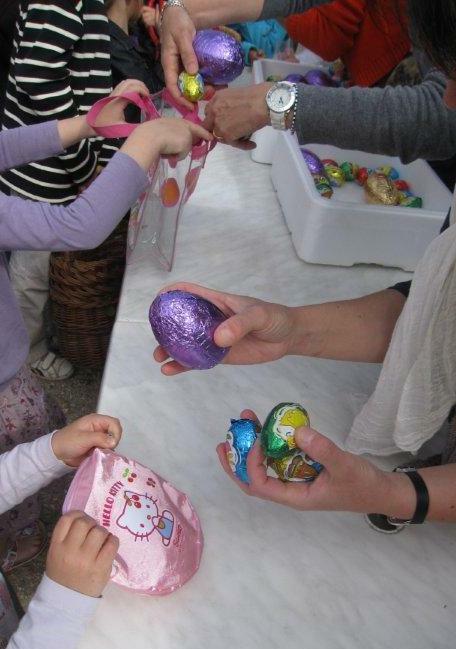 Her view was that the kids just eat the sugar and then it’s gone, but a plastic egg will live for centuries. The eggs hide in the rocks. There are no lawns in our village, but there are lots of rock walls with plenty of cracks just perfect to hide an egg in. Kids don’t keep their eggs. After the hunt was over the girls proudly showed me their eggs. I was very surprised to see them dump their precious eggs into a big basket, and watched as every village child was given exactly four eggs (one big, three little). The eggs the kids went home with had nothing to do with the eggs that they found on the hunt. I wondered if this was just a village thing, but the girls told me they did the same at school. Everybody shares. This is different from the US egg hunts we’ve been too. If a kid doesn’t make an effort (or have a parent who will make an effort for them) they leave empty handed. This is a very basic example of the difference in the thinking between the individualistic American society and the community-centric French one. It’s not like either approach is clearly better. It’s nice that everyone got eggs, not just the big kids who are faster. But then that kid who sat and whined instead of trying got the same eggs as the motivated ones. After hunt glass of wine. 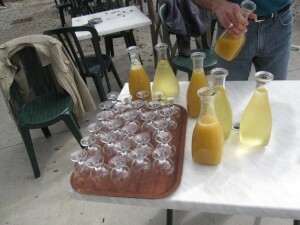 Of course, being France there has to be a drink. This time it was juice for the kids, and white wine for the adults – at 10:30 AM! 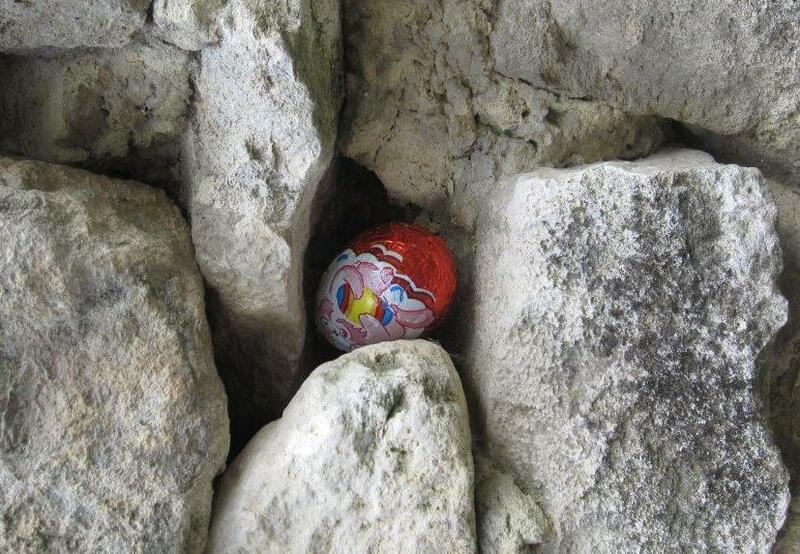 As you now know, in Australia we practice the environmentally friendly type of Easter egg hunt using chocolate eggs. However there is no way on this Earth that we would be seen drinking wine at 10.30am in the morning. Beer, yes. But not wine. There’s no candy in the California egg hunt eggs? I’m feeling the culure shock in both directions! There may be a Canadian middle ground. Around here, anyway, I’ve seen several families, including myself, use plastic eggs, but there is candy in the eggs. Worst of both worlds? But there is less candy then a full chocolate egg (a few jelly beans or a couple of very small chocolate eggs). 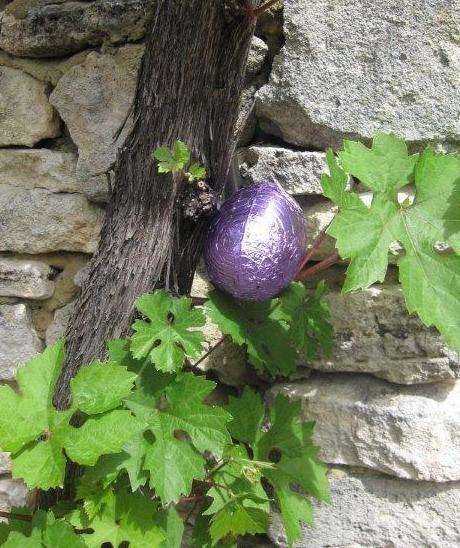 And the kids keep the candy, and return the eggs, which are reused the next year. Sounds like a real egg hunt to me! In Quebec, we use to get the Laura Secord eggs and other large chocolate goodies for Easter. We brought our son to a California Easter egg hunt here and hated it! was/ still is junk that ends up in the trash or worse, artificially flavored and colored candies. Yuck! Interesting observation on US vs. Europe. Personally, I like a culture where effort and motivation are rewarded. So now I wonder about the hunt we did on the boat. All chocolate eggs, but little. The kids had to even out the stash at the end so no arguments but they still got about 14 little eggs each. and Lisa doesn’t like chocolate so it was all about the quest. Does that make it fracanaustralian type of hunt? or all australian in a french setting?